One of the real joys my wife and I have experienced over the last four years is just being a part of something bigger than ourselves. Our involvement in Nigeria has been a blessing for us like no other (outside our children and grandchildren). It comes down to the people. We have been bowled over by both the generosity and concern of the American Brethren and warmth and hospitality of the Nigerian Brethren. Over the last few years we have had the privilege of sending over 30 people from this country to walk alongside their Nigerian brothers and sisters. We are not alone in our appreciation of the Nigerian people. Without exception, everyone that has gone to Nigeria has returned to this country with a different perspective on life and faith. Also, over the last several years, we have visited numerous Church of the Brethren congregations speaking about our involvement in Nigeria. Because of the Church’s concern for Nigeria over $4 million dollars has been raised in support of the people of northeast Nigeria. We have spoken about Nigeria at churches, district conferences, schools and colleges. 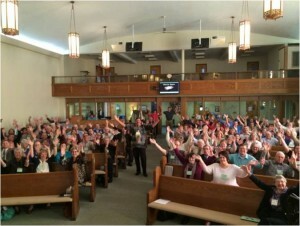 One of my favorite pictures of support was taken at the Middle Pennsylvania District Conference last year. Everyone in attendance is enthusiastically lifting holy hands in recognition of our Brethren in Nigeria. Amazingly, the same type of enthusiasm greets us when we go to Nigeria. One of our favorite Nigerians (one among so many) is Markus Gamache. He is known in EYN as “Jauro.” This is a Nigerian term that means “community organizer.” He is really a frustrated but still hopeful politician. He knows his way around every situation that we have seen him confronted with – from questionable traffic stops on the road to choices of food that visiting Americans will eat to visa applications to get us into the country – Markus handles them all! What a heart he has for his people! There doesn’t seem to be a person who cares more and does more than Markus, especially at this crucial time in Nigeria. Many people have turned to “Jauro” for help in one way or another. Markus has even started an inter-faith community (both Muslims and Christians) to house hundreds of displaced people from the northeast in a safer area near the capital city of Abuja. 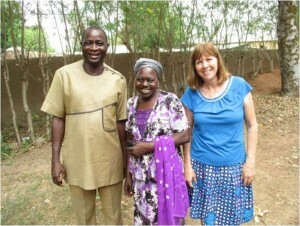 Church of the Brethren is partnering with Markus in this venture. On our most recent visit to Nigeria we ran into a lady with a special problem. This lady, Sara Robert, a converted Muslim, recently graduated from Kulp Bible College. Unfortunately, like so many who have graduated from KBC in the last few years there is no place for her to go. For the men there is no place to go due to the glut of pastors and scarcity of churches. Women, on the other hand, still have no official leadership role in the church (outside of being involved in women’s ministry). To make matters worse for Sara, after graduating she had no home to return to. Our KBC contact, another of our favorites, Joshua Ishaya, asked if there wasn’t something we could do for her? That’s when Markus stepped in. He suggested that she relocate to his inter-faith community near Abuja. He believes that Sara can serve a teacher/principal for the new school that is being built for the hundreds of children living at the camp. I could go on and on about Markus and his wonderful ministry to everyone he comes in contact with but. . .
Here’s one last story that comes to mind. Last year on one of our trips to Nigeria we had the chance to go to Taraba State’s capital of Jalingo. Jalingo is located three grueling hours south and west of Yola. During the insurgency many EYN members fled to Jalingo in search of a safe haven. Markus took us there as EYN was considering purchasing some land to build a displaced persons camp. We went just to look at a particular plot of land. 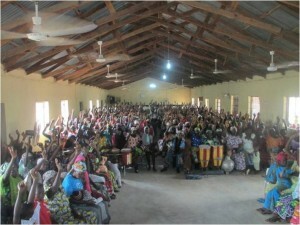 When we got to Jalingo we stopped off at one of the new worship centers for displaced EYN members. Waiting for us there were hundreds of people. Obviously word got out that we were coming and the people had gathered to greet us and possibly receive something from us in the way of food and/or supplies. We were totally unprepared for this large welcoming committee. We were fed lunch in the pastor’s office and asked to greet the people who had been waiting for us for at several hours. I cannot tell you the guilt we felt as we addressed this group of hungry and needy folks. We took some pictures and did our best to greet them in the name of Church of the Brethren. Finally, when we returned to the quiet of the pastor’s office we started to search our pockets for money to see if we could leave this group with something. We could only scrounge up a very meager amount of money. In frustration we asked Markus if he had any money on him. Leave it to Markus; he had over 100,000 naira on him. Markus always travels with some back-up money and he also felt that it was worth contributing all of it to these abandoned brothers and sisters and their children. When he tells the story he always gives me full credit for considering the gifts we gave those people, but I know different. Markus had someone go down to the marketplace and buy beans and corn enough for each family to leave with something. It was one of the most rewarding things that we have been part of in our outreach to the struggling people of Nigeria – thanks to Markus. This entry was posted in Nigeria and tagged Ekklesiyar Yan’uwa a Nigeria, EYN, Nigeria, nigeria crisis, Peace, prayer by Roxane Hill. Bookmark the permalink.